FX (36×24) image area, (L)6016, x4016, (M)4512, x3008, (S)3008, x2008, 1.2x (30×20) image area, (L)5008, x3336, (M)3752, x2504, (S)2504, x1664, DX (24×16) image area, (L)3936, x2624, (M)2944, x1968, (S)1968, x1312, FX-format photographs taken in movie live view, (L)6016, x3376, (M)4512, x2528, (S)3008, x1688, DX-format photographs taken in movie live view, (L)3936, x2224, (M)2944, x1664, (S)1968, x1112, Note: Photographs taken in movie live view have an aspect ratio of 16 : 9. 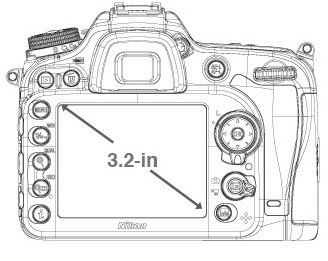 The camera offers a choice of DX- and FX-based formats. Double slot: Slot 2 can be used for overflow or backup storage or for separate storage of copies created using NEF+JPEG; pictures can be copied between cards. Compatible with AF NIKKOR lenses, including type G, E, and D lenses (some restrictions apply to PC lenses) and DX lenses (using DX 24 x 16 1.5x image area), AI-P NIKKOR lenses, and non-CPU AI lenses (A and M modes only). IX NIKKOR lenses, lenses for the F3AF, and non-AI lenses can not be used. The electronic rangefinder can be used with lenses that have a maximum aperture of f/5.6 or faster (the electronic rangefinder supports the 11 focus points with lenses that have a maximum aperture of f/8 or faster). 54 Mbps Maximum logical data rates according to IEEE standard. Actual rates may differ. 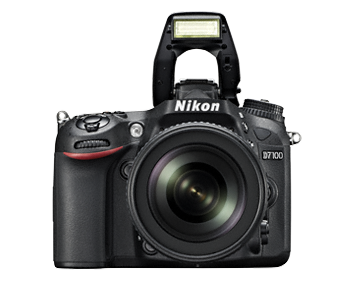 Set your heart on the new D7200, the most advanced DSLR in Nikon’s DX range. The D7200 sets a new standard for image quality with its DX-format 24.2-megapixel CMOS sensor and EXPEED 4 image-processing engine. Its Advanced Multi-CAM 3500 II autofocus sensor module with 51 precise focus points captures super sharp images even in low light conditions. You can even film superior Full HD 1080/60p movies in 1.3x format, capturing distant subjects in a larger size. Share your images and movies instantly with the convenient built-in Wi-Fi® and NFC*1 – a first for Nikon DSLRs. 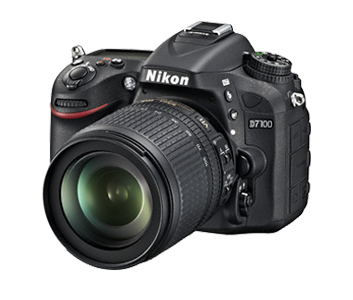 The D7200 is your reliable companion, ready to take the shot wherever you go. From low-lit interiors to sports and wildlife, the D7200’s outstanding 51-point autofocus (AF) system with the new Advanced Multi-CAM 3500 II autofocus sensor module with a detection range down to -3 EV ensures your shots remain clear even in dark environments. The 51-point AF system covers the entire frame in 1.3x, while 15 cross-type sensors in the centre feature higher detection strength, providing superior subject-acquisition performance even for fast moving subjects. 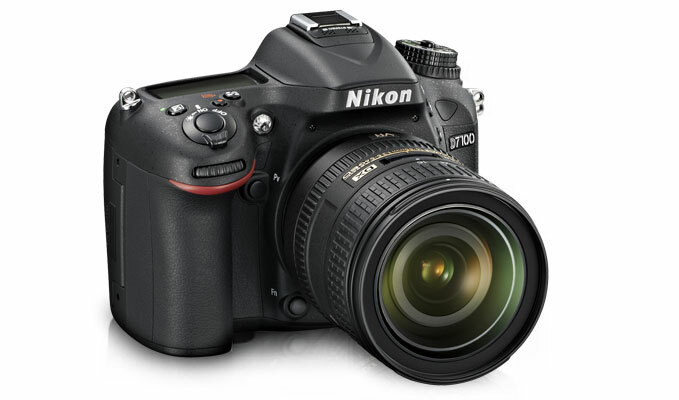 The D7200 offers great flexibility for shooting. Film in a DX-based format similar to that of 35mm film or a 1.3x format for superior Full HD 1080/60p videos. The mode M with Auto ISO sensitivity control allows the D7200 to automatically adjust to the appropriate exposure, so you can shoot continuously from dark to bright areas. Experiment with creativity as the D7200 lets you create beautifully rendered time-lapse movies in-camera, a first for Nikon DX-format DSLRs. Record clearer audio with wind noise reduction when you use the built-in stereo microphone. You can also select your preferred microphone frequency response for specific filming needs such as “Voice” for interviews and speeches. An independent settings menu dedicated for movies enhances operability. Capture the action like never before as the D7200’s increased buffer size allows 100 continuous shots at 6 frames per second*2. Spectacular light trail shots or star trails can now be achieved with the continuous shooting mode. Using a continuous release mode (CH or CL) and a shutter speed set at 4 seconds or slower, keep shooting for as long as your memory card and battery life allow. Share your perspective of the world with the D7200’s built-in Wi-Fi® and NFC*1 capabilities – a first for Nikon DSLRs. Uploading and transferring photos to your social network and smart devices is now easy and seamless. Simply install the free Wireless Mobile Utility*3 app on your iOS or Android smart devices. The built-in Wi-Fi® also lets you shoot remotely with your smart device, minimising camera shake that comes with pressing the shutter. 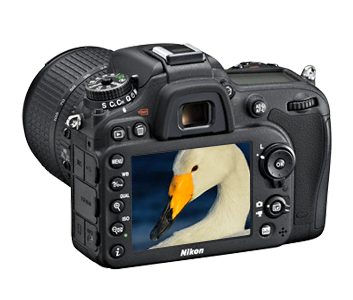 Nikon’s exclusive Picture Control image creation system offers a new level of customisation. The “Flat” option renders fine details and healthy skin tones. It also stores richer information, from shadows to highlights for both still images and movies. This rich data reduces the risk of oversaturation, blocked–up shadows or blown-out highlights during post editing, resulting in images with beautiful colour gradation and contrast. In addition, the new “Clarity” parameter increases or softens your subject’s clearness in still images, while maintaining details and saturation. Inject some fun into your photos with Special Effects like Night Vision, Colour Sketch and Miniature Effect. 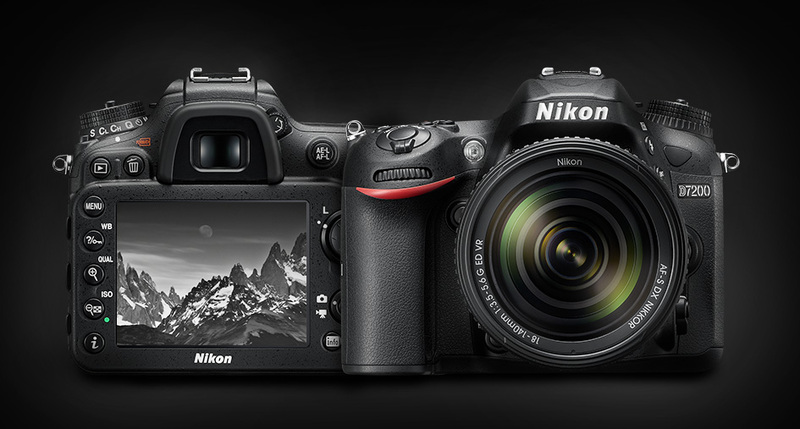 With 100% frame coverage, the D7200 allows you to precisely compose your shots. Setting information is clearly presented in the viewfinder’s organic EL display – a technology that is sharper and more energy efficient. For times when you prefer to frame your shots on the monitor, the wide-viewing angle of the D7200’s 1229k-dot, 3.2-inch LCD display with RGBW alignment provides clarity and enhanced visibility even under bright conditions. The rugged D7200 is engineered with a handy built-in flash in a light yet durable magnesium alloy body. It is shielded against shock, and is weather-sealed to keep out dust and water drops, making the D7200 your trusted companion. Its long-lasting battery life lets you shoot up to 1110 images or 80 minutes of movies at a go. Rough it out with this compact and portable performer which weighs approximately 1250g. Achieve the best image results with a comprehensive range of NIKKOR lenses and accessories. Create studio-quality lighting by pairing Nikon’s range of Speedlights with Nikon’s Creative Lighting System featured in the D7200. The WR-R10/WR-T10 wireless remote control eliminates any vibration caused from manually pressing the camera shutter. Enjoy seamless end-to-end image and video management with the free Capture NX-D and ViewNX-Movie Editor editing software for stills and movies respectively. For those times when you prefer to frame your shots through the monitor, you will appreciate the extreme clarity and wide viewing angle of the D7100′s 3.2-inch 1,229k-dot resolution TFT LCD monitor. This newly developed screen features RGBW alignment technology, offering improved brightness and resolution compared to RGB screens. Nikon D7100 Price in India, Nikon D7100 Specification, user review, Price, Offer, Buy Nikon D7100 in India. Compatible with AF NIKKOR lenses, including type G and D lenses (some restrictions apply to PC lenses) and DX lenses, AI-P NIKKOR lenses, and non-CPU AI lenses (A and M modes only). IX NIKKOR lenses, lenses for the F3AF, and non-AI lenses can not be used. The electronic rangefinder can be used with lenses that have a maximum aperture of f/5.6 or faster (the electronic rangefinder supports the center 1 focus point with lenses that have a maximum aperture of f/8 or faster). 1920 x 1080; 60i (59.94 fields/s)/ 50i (50 fields/s) * 1920 x 1080; 30 p (progressive), 25p, 24p 1280 x 720; 60p, 50p Actual frame rates for 60p, 50p, 30p, 25p, and 24p are 59.94, 50, 29.97, 25, and 23.976 fps respectively; options support both high and normal image quality * Available only when 1.3x (18 x 12) is selected for Image area. Sensor output is about 60 or 50 fps. Featuring enhanced quality and speed, the EXPEED 4 image processor is the perfect companion to the 24.2-megapixel DX-format CMOS. Capture full-resolution 12-bit RAW images at up to 5 frames per second. An improved white balance ensures brilliant whites, greater colour nuances, smooth gradations and sharp edges.Nikon D5300 Price in India, user review, price of Nikon D5300 in India with 18-55 lens , 24 Megapixel digital camera , Best buy Nikon D5300 with NIKON INDIA Warranty. 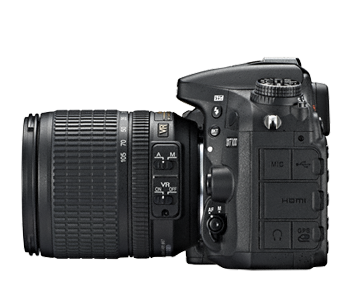 The D5300 is designed without an optical low-pass filter (OLPF), allowing the high resolution CMOS sensor to record the smallest details with precision. Its wide sensitivity range of ISO100 – ISO12800 at normal setting delivers impressive noise reduction and is expandable to 25600 for extreme low-light situations.Nikon D5300 Price in India, user review, price of Nikon D5300 in India with 18-55 lens , 24 Megapixel digital camera , Best buy Nikon D5300 with NIKON INDIA Warranty. For optimal sharpness, the D5300’s accurate 39-point autofocus quickly locks on to and track subjects. Its 3D Tracking mode seamlessly maintains focus even when your subject is moving towards or away from the camera – ideal for videos and sports photography. Choose from a variety of autofocus-area focus modes, including Wide-Area AF, Face Priority AF and Subject Tracking AF to match your shooting styles. Nikon D5300 Price in India, user review, price of Nikon D5300 in India with 18-55 lens , 24 Megapixel digital camera , Best buy Nikon D5300 with NIKON INDIA Warranty. Share precious moments the instant you snap them. Simply transfer shots to your computer or mobile device with the D5300’s built-in Wi-Fi®*, a first among Nikon DSLRs. A free Wireless Mobile Utility app lets you remotely control the camera with your mobile device.Nikon D5300 Price in India, user review, price of Nikon D5300 in India with 18-55 lens , 24 Megapixel digital camera , Best buy Nikon D5300 with NIKON INDIA Warranty. When travelling, record GPS and altitude information to your images so you can relive your adventures with ease and convenience. A travel log function automatically maps your journey (with location points recorded at 15, 30 or 60-second intervals) even when the camera is off.Nikon D5300 Price in India, user review, price of Nikon D5300 in India with 18-55 lens , 24 Megapixel digital camera , Best buy Nikon D5300 with NIKON INDIA Warranty. The D5300’s large vari-angle monitor makes it easy to shoot from a variety of angles or to put yourself in the picture. Its 3:2 aspect ratio offers a wider full-frame view compared to conventional 4:3 monitors. With its 1036.8k-dot resolution, a 170º viewing angle and enhanced brightness, you’ll view your images with greater clarity. Nikon D5300 Price in India, user review, price of Nikon D5300 in India with 18-55 lens , 24 Megapixel digital camera , Best buy Nikon D5300 with NIKON INDIA Warranty. The D5300 lets you record videos with cinematic quality and stereo sound. The autofocus continuously tracks subjects to ensure fluid motion and crisp details. 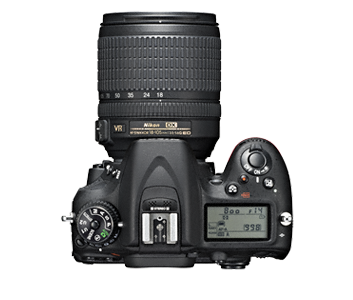 The frame rate can be set at 60p/50p/30p/25p/24p for additional video options.Nikon D5300 Price in India, user review, price of Nikon D5300 in India with 18-55 lens , 24 Megapixel digital camera , Best buy Nikon D5300 with NIKON INDIA Warranty. The D5300 is available in red, black and grey. For greater control, versatility and creativity, choose from an expanding line-up of NIKKOR lenses and accessories including Speedlights, Wireless Controllers, image editing suites and more to match your shooting style. Continuous L : Up to 3 fps Continuous H : Up to 5 fps (JPEG and 12-bit NEF/RAW) or 4 fps (14-bit NEF/RAW) Note: Frame rates assume continuous-servo AF, manual or shutterpriority auto exposure, a shutter speed of 1/250 s or faster, Release selected for Custom Setting a1 (AF-C priority selection), and other settings at default values.